The Ed Kinney Series is a monthly program of historical character portrayals and speakers. 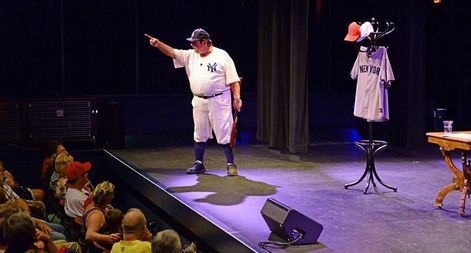 Spend an evening with historic characters such as Mark Twain or Babe Ruth and hear from speakers who are experts in their fields. Many of the speakers in the series are Chautauquans, a type of historical character performance originating in Chautauqua, New York. 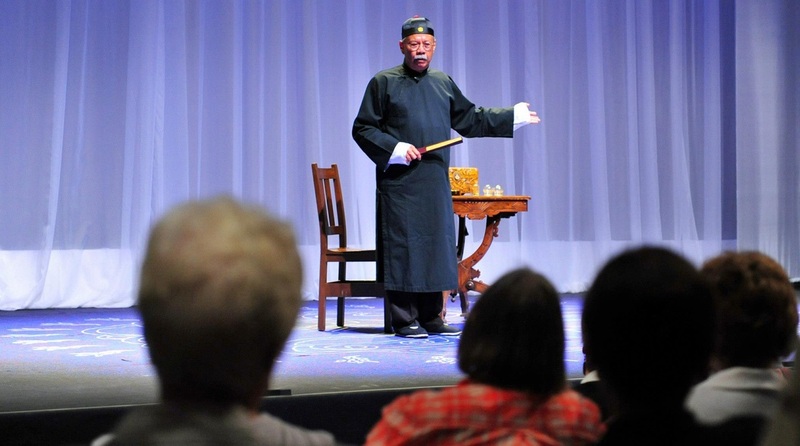 The Chautauquan is in character from the moment they step onto the stage, through a Q & A portion, and finally will step out of character to answer questions that the historic character they portray could not address. DVDs of select lectures are available for purchase at the Museum on Main Gift Shop. Special thanks to Michael Bruner of Brogan Video for recording services. Museum on Main’s annual series is named in honor of former Pleasanton Mayor Mr. Ed Kinney. Mr. Kinney was a resident of Pleasanton for many years and was a wonderful advocate for the city. His involvement and service to the city inspired both the Ed Kinney Series and the Ed Kinney Community Patriot Award. He also served as a Vice-President for the Amador-Livermore Valley Historical Society (Museum on Main). Mr. Kinney is warmly remembered as the emcee of the parades in the downtown where he would broadcast from the balcony of the Pleasanton Hotel. TICKETS ON SALE DEC 17! Members of Museum on Main receive discounted ticket rates and passes for free tickets! Find out more about Membership Benefits. Curious about the 2020 Season? Please note: All ticketing for the "An Evening With..." Series is through Museum on Main. The Firehouse Arts Center Box Office does not handle our ticketing. *MEMBERS WITH LECTURE PASSES: Please note, Member lecture passes MUST be applied to your ticket order. You may call us at (925) 462-2766 or come to the Museum on Main in person to order your tickets and apply your passes. Your lecture passes do not guarantee tickets. Many of the shows in the An Afternoon or Evening with... series sell out. Tickets may be available at the event subject to availability. Cash, check, Visa and MasterCard accepted. Tickets purchased online will be available for pick up at Will Call in the lobby of the venue on the evening of the event. Charge tickets by phone at (925) 462-2766. Tickets purchased by phone will be available for pick up at Will Call in the lobby of the venue on the evening of the event. Visa and Mastercard accepted. Buy your tickets At Museum on Main during regular operating hours. Cash, check, Visa or Mastercard accepted. Nobel Prize recipient John Steinbeck has written many classic works that have been woven into the American literary canon. Steinbeck will return to reflect upon his life and writings, as well as what has happened since his death. Steinbeck's focus will be on his last two books, both non-fiction: Travels with Charley in search of America and America and Americans. John Steinbeck will be portrayed by scholar Tom Lorentzen. ​War is always a controversial topic, but for Eleanor Roosevelt during World War II the stakes were very high. She had to navigate between her ideals for peace, and her role as the First Lady of a country embroiled in the largest war the planet had ever seen. Eleanor Roosevelt will be portrayed by Chautauqua scholar and actress Susan Marie Frontczak. ​During his few weeks as Vice President, Harry Truman scarcely saw President Franklin Roosevelt and received no briefing on the development of the atomic bomb or the unfolding difficulties with Soviet Russia. Suddenly these and a host of other wartime problems became Truman’s to solve when he became America’s 33rd President. Truman will be portrayed by actor Peter Small. ​Once described as one of the most charismatic rulers to sit on the English throne, King Henry VIII is known in modern times for his six marriages and his role in the separation of the Church of England from the Roman Catholic Church. Professor, author, historian and Chautauqua Frank Mullen. will be reprising his role as King Henry VIII. ​Pablo Picasso is a name synonymous with modern art. He was a Spanish painter, sculptor, printmaker, ceramicist, poet, and playwright. He is regarded as one of the most influential and innovative artists of the 20th century. Historian, actor, and scholar Doug Mishler will be portraying the famous artist. ​Hear from one of America’s greatest explorers, William Clark, who along with Meriwether Lewis, led the Lewis and Clark Expedition from 1804 to 1806 across the Louisiana Purchase. He will recall his time as an explorer, soldier, planter, Indian agent, territorial governor, and Superintendent of Indian Affairs. Scholar and actor Hal Stearns will portray William Clark. ​Back by popular demand is comedic legend George Burns. At 100 years young, George Burns left a legacy of laughs as one of the few entertainers whose career spanned vaudeville, film, radio, and television. Film and Broadway actor Duffy Hudson will reprise his role as Burns in this musically entertaining portrayal of the beloved cigar smoking comedian. the Director of Education at (925) 462-2766 or education@museumonmain.org.